On the day of the migration, we seemed to lose incoming calls on the phone line, as the Kelly engineer who was running late, couldn't call us to tell us he was running late. So our morning install appointment commenced at 1:15. The engineer didn't have the vDSL faceplate for the new NTE5 boxes so fitted the mk3 interstitial faceplate to the existing NTE5. After a minor glitch all was up and running, at least on the BB. The engineer expedited the phone migration, or at least half of it, so we had outgoing calls but not incoming calls until some time in the early hours of the following morning when the bots must have completed their stuff. Pretty good. The fibre cabinet is the other side of our front garden wall, so it was just about guaranteed that we would get full 76/19 sync. I've started to run the TBB Quality Monitor and the connection looks pretty good (see here). TBB speed test speeds are a bit variable (different browsers / hardware and the flash and non-flash versions give slightly different results), but obviously much quicker than the Sky ADSL connection. The results tend to less linear in the evenings though. Pulse8 have been great throughout the process. Hey jaydub - can you post a link to your live BQM graph? Pulse8 are at the top of my shortlist. Yep I would like to see a speedtest at peak hours, that looks like possible congestion at 09:05AM. Are you using ethernet when testing? I am running the quality monitor, but probably shouldn't be as I am not on a fixed IP. Just started one on my current IP address, so give it time. TestMyNet speeds are in the same ball park as the single thread results. I have been in dialogue with Sam about it and he has reported that the only issue that is being returned is the connection to the router, however it is very vague as it could be internal or external. I've moved the connection to the master socket and both his results and mine are no different. The problem is that I ace the Pulse8 Ookla speed test which is a multithread test (and possibly running on port:8080), so the line is well above the threshold speed where they can raise a fault. I may just jump to their business product for a few days (if they can offer that) to see if it improves things, which should hopefully tell us whether it is congestion or not. Please note that I had similar speed issues on Sky ADSL. Very similar day and night, so my suspicion is it's not specific to the Pulse8 TTB connection. 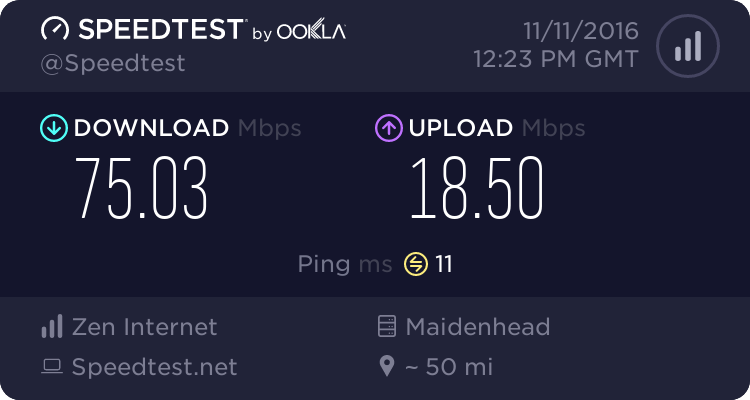 I did not see that kind of speedtest on my Sky, TalkTalk or BT connection (apart from when Sky did genuinely have congestion). Are the Sky tests wireless (they have 2.4Ghz WiFi on most routers)? My TalkTalk line is also the same. EDIT: I also test over WiFi using default ISP supplied router and a macbook pro 2014 retina. I am always running the quality monitor (see sig). Speed tests can vary somewhat but I rarely see the x1 match the x6 test. Spoken to Sam and Adam and moved up to their business package about two weeks ago to see if it helped, made no difference from what I can see. Have tried two Asus routers, dedicated pfSense box and now running an Edge Router Lite, all with same result. All tests with direct connection to the master socket with a Mk 3b faceplate, hard wired not wifi. The Pulse8 Ookla speed test shows 64mb (same as the x6 test here) as it is multithreaded. Modem line rate right now is 68651 down and 20000 up. FEC total stands at 3,100 and HEC or 3,000, BT OR modem has been up for 5 days. Based on my performance on the residential package compared to the business one I would put this down to congestion. The fact that the FTTC is "the other side of our front garden wall" does not guarantee maximum speed. The local FTTC here is probably a similar distance, about 10 Metres from my front door; but the link cables to the PCP travel about 50 Metres to the PCP, followed by about 250 M of original phone cabling, to get to my front door, still only 10 M from the FTTC. I forget the site which gives forecast BB speeds; but when I used it to extract the forecast speeds for all 77 houses on this estate, it showed that my house and the others in the immediate group, were likely to get the slowest BB speed, whilst geographically the nearest to the FTTC; and second nearest geographically to the PCP. The most remote houses on the estate, about 500 M from the PCP, are forecast to get faster speeds, although not maximum. The estate was fully phone-wired during build on a greenfield site in 1967, so no obvious reason for the extended wiring. So the geographic locations of the FTTC and of the PCP are not reliable indicators of likely Broadband performance. That just indicates some congestion somewhere. As I've said the X1 is fast enough not to slow things down majorly, a vast majority of things you do online are single threaded so multi threaded speedtests can be misleading of the actual performance you see. Pictures, adverts and anything else linked to can often come down a new stream though. I did not know that, overall the speedtests are fine, usage will not be noticeably impacted at the speeds they've linked to. Not 100% perfect but nothing to spend time worrying over in my view. Until you have 2 kids on Netlfix, another kid using Sky on demand, the last kid on youtube, me working or online games playing and wife surfing and using iPlayer. Having managed to borrow a Huawei modem and a Technicolor router, I have now had chance to test my connection with the ZyXel 8924 in VDSL mode, the ZyXel in combination with the modem and the Technicolor router with the modem, I think we can rule out the ZyXel as being the cause of the problem as both the download and upload speeds are a smidge faster. I'm now torn between paying £6 extra to go to a Business connection with no great expectation of a fundamental improvement or being pragmatic and saving £6 a month on a 40/10 connection, where I should be able to max out the connection. In terms of our usage, we probably don't need anything quicker than 40/10, however it would have been a shame not to have tried to get full speed, what with the FTTC cabinet just being the other side of the garden wall and all that. Here are some speed tests from this morning. The speed tests were a bit variable, possibly because I am having to use my work laptop when testing on the iMac. These are definitely the worse I have seen. The tests were run on the iMac, but I can't rule out that Outlook was replicating on the laptop mid-test though. All the kit swapping has upset the DLM, so now have an interleaved line. Sync speed dropped from 80 to 76, multi thread download speeds have dropped from 65-70 to 40-50, single thread speeds now dropped to under 40 and ping times have doubled. Getting closer to giving up on the 80/20 connection and dropping to 40/10. All the kit swapping has upset the DLM, so now have an interleaved line. I get the feeling that ZyXel sync's too high for some reason. No real evidence to support this. Since the two snapshots were taken a few days apart, they look remarkably identical, at least to my untrained eye. Realised that. just wondered why there were so many hops before hitting the outside world. Adrian a quick question, and apologies but am absolutely new to this. Your post tells me that on an Uno BT FTTC, the data is transmitted over daisy backbone ... Would that be right? If so why is BT not being used and what difference does it make to FTTC to be provided in this manner? I have no idea why it does that Bob, it always has . Whatever, the line is consistently blazing fast which is all I need to know. That's correct Mac. There is a handover from BTW to Daisy , how , when or why you'd have to ask Matt at Uno. It maybe they purchase the service from Daisy. What I do know is Daisy have a very reliable network, a few years back I was with Xilo on their Pro 75GB LLU and that went out over Daisy . The connection was superb, the only problems came from external events like a cable being dug up in London , Xilo (UNO) and Daisy never once had an issue. Not too much chance of that. I'm far too tight fisted to keep on buying routers and swapping ISPs. I may just buy another router so I have a back up option should the current router fail, but struggling to see anything on the market that is likely to outperform my ZyXel VMG8924-B10A at a price I want to pay! I'm really just trying to understand what the root cause might be to give me an indication of whether an ISP swap might improve things. I did email a few top end ISPs before Christmas, but they were all unwilling to commit to being able to deliver a significant improvement and there wasn't a great deal of consistency in there suggestions of what might be the cause. Having tried the Business product and not seen any benefit from the increased prioritisation should at least rule out some of the causes. I am having an inner battle between the scientist in me that wants to understand why we are seeing the single thread slow down and the pragmatist in me that says just get on and use what is after all a perfectly adequate working connection. P.S. Tried testing the non-Flash version on the iMac with Chrome, FF and Safari both with and without AV loaded and there was no discernible difference between the results. I like your IE11 one better. As what is hopefully a final update to this thread, I had a nice speed test surprise this morning. Pulse8 are upgrading all their customers packages, which must have resulted in the problem TTB kit being bypassed. Hopefully all other Pulse8 users that were having single thread speed issues will see a similar improvement in their results. Keeping my fingers crossed that it will last. In what way? I don't see any news on their site. All home fibre packages are now business grade with a 48hr target fix time (Care Level 2). All business fibre packages now have enhanced line care with a 24hr target fix time (Care Level 3). Perhaps phone only customers received a different email? All I've been told is that we are now on a different back end network code, whatever that means. Ah - I did see "Faster High Priority Business Grade Home Fibre ..." on the product description but it didn't connect with my brain that it had changed. I just assumed the 'upgrade' was for the lead time on fixing faults, wasn't aware it actually changed a users connection? No neither was I, but it is. As I understood the previous products they were TT Retail products with higher backhaul priority. These appear to be TT Business products with the business backhaul settings and TT support levels. Bot of course sold to resellers by TalkTalk Business Wholesale. Interesting. I have been having intermittent speed problems on ADSL2+, for last month. 0.3 up and down last Sunday. Now everything running faster and reliably since Tuesday. I do wonder if there was a capacity problem, which has been resolved with additional bandwidth for fibre customers. Freeing up capacity for other users. Well I am now looking at P8 - purely for the cheap as chips line rental. I hate it when something is forced upon the consumer and at a very extortionate price - such as current BT line rental costs. Does anyone have P8 ADSL and if so is it ok? I am not sure I can be arsed with another FTTC line when all it currently does is stream Amazon and IPTV. ADSL been fine for me, no reason to update to fibre yet myself either. Thanks for the feedback. It's something I am considering as not sure I need FTTC for what I currently use the BT line for. I moved to P8. For Line and ADSL2 Broadband Package. Other than last month. I have never had problem since Joining. I was fed upd with BT Anytime cost., especially the setup mobile charges. Now have 1p / minute for local calls and a Virgin 250 Min mobile £5 package. Gives complete flexibility at less cost. Very rarely do lines cause problem, only once in 30 years for me. Thanks for the replies bob and flippery. I'm just watching what happens with my TV tonight when I limit the connection to 15mbps. if it all plays fine then I will go with ADSL, I know I can get 15mbps i've had it before. It's a shame this thread was not entitled Diaries of a Pulse8er or something - would have been much cooler! Obviously didn't keep them crossed hard enough. Also back on a 38 Product, even though I though i had agreed with Pulse8 to stay on 76XL. I'm a bit confused as I was managing to access my work VPN and email whilst all that redness was going on. Your link has a real "full stop" at the end. The BQM looks utterly dreadful even now wrt base latency. I think you may have serious DLM interleaving and "delay" milliseconds added. Re the 38/10, and looking at your surprise 76/20 result after you had downgraded, I have the feeling the Pulse8 order to upgrade everyone was going through on the basis of the customers' connections when the order was created, which may have had you on it at 78/20. Then the bulk order was submitted and you jumped up again. Adjusted down again when someone realised. Your post reads as though you rang about the surprise return to 76/20, but maybe that didn't get through to the person checking befores and afters? Sees you as 38/10 pre-bulk upgrade and 76/20 post, so got it dropped down again. Or maybe it did get through but too late to stop the second downgrade. A further thought - re being dropped back down to 38/10, is that confirmed by your upstream sync speed? Or has all that red resulted in banding being applied to the line? What does a thinkbroadband speed test show? I'm a bit confused about the ping responses though. BQM shows 30ms+; f8lure 21ms, yet if I ping www.thinkbroadband.com I am getting 12ms returns. Guessing it was stable on 80/20? Wondering as Bob mentioned that the mass migration to this new node or whatever it was has been cancelled out by you downgrading to 40/10. Did a quick speed check and I am still seeing the benefits of it. Hopefully Sam or Adam get it sorted for you this morning. Regrade back to 76XL product underway. Also asked to move to fixed IP address. My patience is starting to wear a bit thin! Yeah I was a little miffed when I rang about the whole issue around single thread test and was told that to get the same as x6 at peak was expecting too much. Yet it seems it has been magically fixed with whatever change was made. Happy because I am now back to where I started 15 months ago with P8 but unhappy because I was told there was no issue (clearly there was and it wasn't cab or exchange related) and I am currently paying the extra £6 for business and I am now loathed to remove it as I have no idea if it will have a detrimental effect! Wondering if a jump to TTB (don't like the idea of a 2 year contract) would make more sense as it is cheaper (you get 4xIP and unlimited landline and mobile calls). From what I can tell there would be no difference in the fibre service itself as P8 are simply reselling TTB services. You get the customer care from P8 but from what others have posted the TTB customer service is pretty damn good. AAISP are using some of their own servers from what I understand so that would differ slightly. LOL really!? That's shocking, that would make me think twice, especially with no contract to tie me to them. You would have thought they would keep that in mind when dealing with customers. From what I saw the £6 add on bumps you from care level 1 to 2 in terms of Openreach response/fix times. I just called TTB support and they were really efficient, even when you raise a case online they come back well before their estimated response time and usually have it fixed first time. My bill is £45.85 all in. I use the talk2Go app now so I have gone for a cheaper limited mins but lots of data sim only plan. Yes the inclusive calls are a decent offering too. makes the line rental charge worth it as opposed to BT where I pay £18,99 and get nothing, not even weekend calls. It is the back end TTB support that are unwilling to recognise the reduced single thread speed as an issue. P8 have certainly been willing to push the issue in TTB's direction for me. I would be very reticent to tie myself into a 2 year TTB contract as a result. I know of one ex-TTB customer who had the same single thread issues, got hacked off with TTB's intransigence, migrated to an Uno TTB connection and now has no single thread issues. I am still of the belief that the issue is peering related in that it doesn't affect all sites. Try running speed tests from TestMy.Net as a comparison. It is another single thread tester, however it gives me much better results than the single thread results on the TBB speed test. But back to your topic Have P8 fixed the issue yet? That will be a 'No' at the moment. Order is placed with TTB and awaiting TTB action. My experience exactly. Matt said that Uno route differently to Pulse8 TTB and that is why I was trouble free with what seemed the same resold product. It's quite easy to get too screwed up about the single thread TBB results. It's very difficult to know whether it makes that much difference in real life anyway. What's really hacking me off at the moment is the fact that P8 and TTB seem to be tied together by knicker elastic at the moment and quite stretchy knicker elastic at that. P8 thought I was on the 76XL Product until I contacted them this morning. They've certainly been very prompt about placing the regrade order with TTB following our discussion, even if TTB haven't been quite so prompt to react. It's good they have been on the ball. That link gave me nothing more than 6.1MB/sec so I assume that's the problem rearing it's ugly head. It's the same on my current BT Infinity line as well. With the help of PhilipD on Kitz, I now recognise the sea of red was because my IP address changed when TTB moved me back to the 8/10 product. And the reason the BQM response times were that much higher than I was seeing when pinging TBB.com was because the BQM was tracking someone else's line. What a glut, eh?! Still waiting for the regrade back to 76XL to happen. Suspect it will be an early hours of the morning job as it usually is. That makes sense re the BQM . Re what happened to your account, I am sure my earlier hypothesis is correct. The timing of your product downgrade in relation to the bulk basic service upgrade, followed by a manual adjustment to correct any anomalies. The person doing the corrections not being aware of an intervening phone conversation between you and someone at P8 agreeing you would remain on the accidentally regained 76/20. So P8 line rental is £13 unless you have their BB and then it's 6..
Dosen't seem such a good deal now when you drill down into it. For ADSL, you are correct, but for fibre it's included within the monthly cost. Remember the calls are dirt cheap though (although this may not apply to you). My monthly bills have been well under £1. ah okay- Adam just told me it was £13 for line rental when I have internet elsewhere but they are dropping their price from £38 to £35 in April. He didn't make it clear that line rental was included. It's all over their website telling you. Just hover over any "I" symbol . If you click the "I" you may get a fuller listing as well, particularly on the line rental page where you get to see all the optional extras. Such as caller display, which is the only one I have. I see doing that on the ADSLx page that the top one is Annex M.
I pay for Caller ID and just about to pay £2 for a fixed IP address, but those are my only extras. That's roughly what I thought, however Pulse8"s system had me down as being on 76XL even though I was on their 38 product at the time. I think they may have been guilty of placing orders on TTB without keeping their admin up to date and this certainly explains their incorrect January invoice, which was quickly sorted. I think you may be correct in that TTB were actioning the product regrades in a two stage process and were moving me from the old 38 product to the new 76 and then downgrading me to 38. I'm back on the 76 product this morning and getting much better results again (although seeing some variability from test to test. Firefox on my work Win7 laptop is doing something altogether more bizaar with constant single thread and multi thread speeds, but with the multi thread significantly slower than the single thread speeds. I knew it was £6 if you take their service, I believe he was talking about them and other ISP - well simple way to clarify. what do you pay them? £6 or £13? £13 + £1 caller display. It's included if you have fibre as that's delivered by MPF. With ADSL, you are contracted for a broadband only service and you don't have to have your phone line with them. If you have ADSL with them, it's £6 a month. If your ADSL is with another ISP, then it's £13 a month. Moved to static IP address at 11:30 and the single thread performance issues have returned. Looking at the traceroute suggests that it is the internal routing that has changed, as the first three steps look to be identical to the traceroute I took last Friday when on a full speed connection. No idea what is going on now. tbh id just forget about it. I know its not ideal, but according to those speedtest you're still getting 42mbps down, which is still fast and probably more than you will ever need. Pulse 8 checker said Superfast Fibre available for my line at 8.8mb down 0.8mb up. Not that I have any need for Fibre anyway for my usage. Been a good week this week. Firstly, TTB (driven by Adam) have managed to identify whatever was causing the poor single thread speeds and now getting single thread speeds that match the multi thread speeds. Secondly, Pulse8 have just announced a drop in their pricing, so my 80/20 fibre will drop from £44 to £39.90 from 1st April (plus £2 for a fixed IP). So will be staying put for the time being. Looks good. I assume its repeatable. Is the speed test auto-detecting Pulse8 as well now? It used to pick up TalkTalk. The change could be part of when they upgraded the packages to business level rather than retail. They must now have their own allocated IP address range. Which is surprising seeing as I wouldn't have thought there were any ranges available. Unless TT have released some to them. Yes, it is repeatable, although I do get an occasional first test blip which disappears if I do a follow on retest. I discovered a week or so ago that by doing PPP disconnects and reconnects I could bounce myself onto a good connection. Pulse8 have always been on business connections as far as I am aware. (They definitely were when I joined them last November.) It's just that they are all on the highest priority now, which you only used to get if you paid £6 more for a Biz product. Pulse8 are just TTB resellers, so the speed test still picks up TalkTalk automatically. There is a confusion there about business connections. All Pulse8 have always been on TalkTalk Business Wholesale, but that is basically equivalent to BT Wholesale. They have also always had "Home bundles" and "Business bundles". The same as most BT Wholesale based ISPs have. AIUI the Pulse8 Home bundles now run on the same service as the Business ones, with the Business ones still having some better provision. I haven't looked into it in depth though . Just had a trawl through my email history with Pulse8. When I contacted them regarding migration, Adam wrote to me at the time of migration and said "We use the back end of Talk Talk Business.". And after all they are a TTB reseller, so it is difficult to see how they can be offering anything other than a TTB service. It's hard (for me at least) to explain. Somehow I might have confused you by even mentioning BT Wholesale earlier, when I was just equating TT Business Wholesale to it. I wasn't meaning the Pulse8 Home packages ran on BTW. The confusion is caused by TalkTalk providing a service to resellers, and calling it TalkTalk Business Wholesale. Easiest perhaps to rephrase it as TalkTalk Wholesale for Businesses that are Resellers. TalkTalk's own service has a Retail product range and a Business product range. BT that many of us use has Home user and Business user ranges. Plusnet has Home user and Business user ranges. Both of those ISPs sell only BT Wholesale services. But what if BT Wholesale was renamed to BT Business Wholesale? Purely the name would change, not the services. Similarly, in reverse, TalkTalk Business Wholesale could have been called TalkTalk Wholesale. Think of John Lewis Broadband. That is basically a resold Plusnet service running on Plusnet routers and backhaul. With Plusnet relying on BT Wholesale. Pulse8 has always had two ranges, Home user and Business user. The Home ranges were TalkTalk provided by TT Business Wholesale but running on the same "network/backhaul/systems" as TalkTalk Retail. At higher priority than TalkTalk Retail itself. In a similar way that John Lewis runs on BT Wholesale via the Plusnet internal network for the ISP services. The Pulse8 Business ranges may or may not have been on the same but with higher priorities still, I don't know. The same as on ADSL Max BT Wholesale had a higher level service called Max Premium or something like that. Higher priority through the network and 832Kbps upstream instead of 448Kbps. Puilse8 recently upgraded so the Home ranges, and obviously now if not previously the Business ranges, run directly on the TalkTalk (Business) Wholesale backbone. Neither is a resold TalkTalk Retail service. It's more like John Lewis ditching Plusnet and becoming a stand-alone or more likely a white label ISP on BT Wholesale. Which is what years ago Vodafone were, and the Post Office were until they handed it over to TalkTalk instead. EE Broadband even now I think is BT Wholesale white label. No routers or internal network of their own is the best way of describing it. Thanks for the explanation Bob, even if it leaves me slightly nonplussed about what connection I actually have. Happy to publish the Gateway servers I connect to in an attempt to confirm whether or not they are Business or Home gateways. Whether these will be common or not with what the true TalkTalk Business or Talk Talk Residential users are seeing is anybody's guess. If you are on a Fibreoptic Home package you are on a business grade backhaul connection, just like the Fibreoptic Business packages are. You also get the enhanced care that goes with it, primarily I think a faster TalkTalk/Openreach response to fault reports. Before Pulse8 recently upgraded all their Home packages for all customers they were (AIUI) directly reselling the TalkTalk home product not on the business grade. Though the Pulse8 traffic was on a higher priority than TT Retail customers. It was reported a while back that TalkTalk retail customers were on the lowest priority, 7. Pulse8 customers were on 3, 2 or 1 depending on which package they bought. What TalkTalk priorities Pulse8 customers are on since the upgrade I don't know. But they aren't on the retail service anyway now. I've seen that thread, but IIRC it was regarding ADSL services, so not sure how applicable it was to the fibre services. According to Adam, the only difference between the P8 Home and Business packages is that "the business lines will have Care LVL3 instead of Care LVL2". I wonder how the priority works too. Is this only when nesr full capacity and the P8 traffic will take priority over TT residential users? No idea sorry. I'm only going by what the website popup help has on the packages, and posts in these forums.